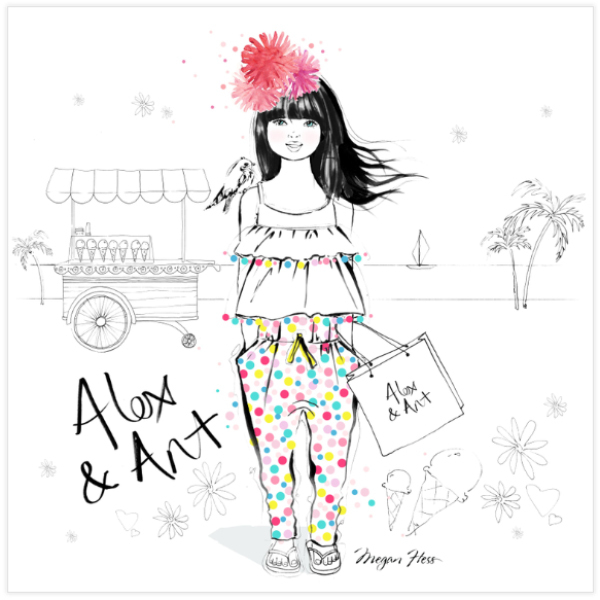 One of my favourite Australian illustrators, Megan Hess, has teamed up with exclusive Australian fashion label, Alex & Ant and for the first time has illustrated for the children’s industry. Oh so exciting for someone like me who loves Megan’s work, loves gorgeous children’s wear and, as my Instagram followers well know, loves creative Australians! Megan’s beautiful illustration is inspired by Alex & Ant’s Summer 14/15 collection. Are you in love like I am? If so you can print off your very own black & white version for your little one to colour in. Click here to download a PDF you can print. Want more? Enter Alex & Ant’s Instagram and Facebook competition to win an Alex & Ant outfit of your choice and the chance to become the profile pic for Alex & Ant. All the entry details are at the bottom of the black & white PDF. Competition closes on 15 September 2014. If tagging on Instagram, don’t forget to tag @alexandant @meganhessillustration and hashtag #meganhess #meganhessalexandantcomp. I’d love to see your creations too so if you tag @catherinegrace__ I will also be able to see them! Good luck and get colouring.